Have you considered that applications are your competitive advantage — and help you compete for customers? The faster you’re able to deliver applications, the better you can compete. Given this reality, many application development and delivery pros are wisely turning to DevOps to deliver applications faster — and more reliably. Yet, rapid delivery leaves some IT leaders nervous about quality and cybersecurity. Does faster delivery equate to haphazard decisions and compromised cybersecurity? 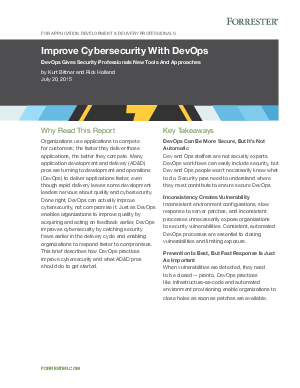 Done right, DevOps can actually improve cybersecurity, not compromise it. DevOps helps build in quality from the start, allowing you to gather and act on feedback earlier, catch security flaws sooner in the delivery cycle, and respond faster to compromises. Why consistent, automated DevOps processes are essential to closing vulnerabilities and limiting exposure. Practices, such as infrastructure as code and automated provisioning, for closing holes as soon as patches are available. How DevOps and security professionals can work together to adopt DevSecOps.